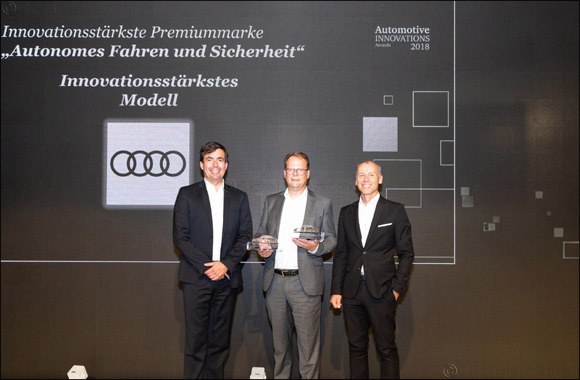 Dubai, UAE, June 21, 2018: The Audi A8 is the most innovative model of the year 2018 and Audi is the most innovative premium brand in the “Autonomous driving and safety” category. The “Center of Automotive Management” and consulting firm PricewaterhouseCoopers AG, who together present the “Automotive Innovations Award,” reached this verdict. The victory for the Audi A8 is testimony to the numerous innovations which the brand’s flagship delivers. The active suspension took first place in the rankings. In the case of a side impact it mitigates the risks for passengers by instantly raising the body by a few centimeters. The exit warning, the laser scanner and the HD Matrix LED headlights with Audi laser light also provided the large sedan with important points. With the “Automotive Innovations Award,” which was held for the seventh time in 2018, the most innovative automakers and suppliers of the year were singled out for praise. The manufacturer’s standings were decided based on a study of the database maintained by the “Center of Automotive Management” in Bergisch Gladbach. An expert jury reached the decision for the suppliers. A total of 1,296 innovations from all leading automakers involving around 60 brands were incorporated into the 2018 rankings.